Hannah is officially 4.5 years old and although she says she wants to live at home with her mom and dad forever, I'm pretty sure her current career aspiration is to be a fashion designer. Every day she wants to pick out her own outfit - complete with accessories, shoes, and purse - and then upon coming back home she asks to play dress up and change into something completely different. This is why her favorite package that the postman delivers is the bright pink bag from Fabkids. In case you aren’t familiar, they are a subscription service that offers you a complete outfit for $29.95 a month. Every outfit includes 2 pieces — so you can get a fabulous dress, paired with leggings OR a top and a bottom, etc. They make girls and boys clothing with a wide range of sizes. Hannah is wearing a Small (4/5) in this video, but I'll be moving her up to a Medium (6/7) soon. They carry XXS (2T - which William has just started wearing!) up to XL (12). Here is her unboxing video for April's outfit. I love her reaction! 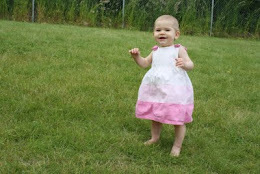 Thanks to FabKids for providing Hannah's outfit for review. impressed with the quality (and cuteness!) of their clothing. I highly recommend them. See disclosure for details.